Good afternoon everyone! I hope you are all having a great day! Today I am starting something new that I hope you guys will enjoy as much as I do. 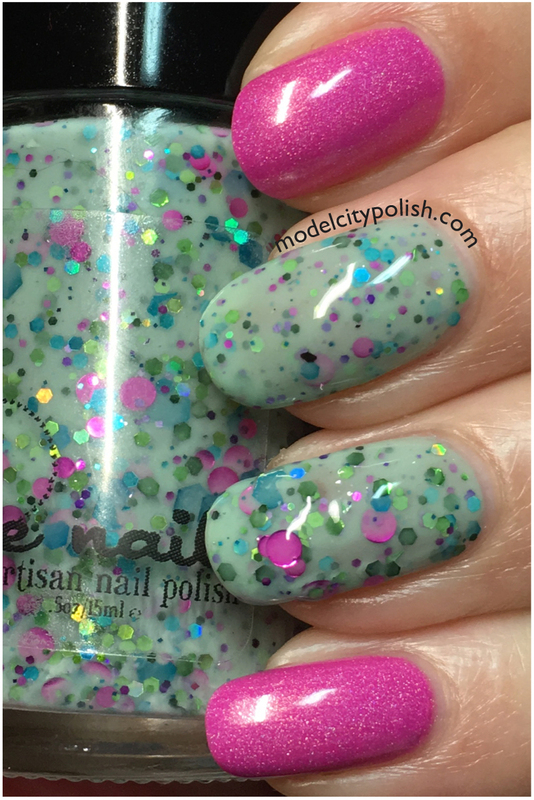 As the polish collections get larger, it is sometimes tough to give them all the proper love. That got me to thinking and I decided to start coming up with fun pairing options for what I now am calling Two for Tuesdays. This is a great way to dust off some oldies and add fun looks for those times you are in a rush. 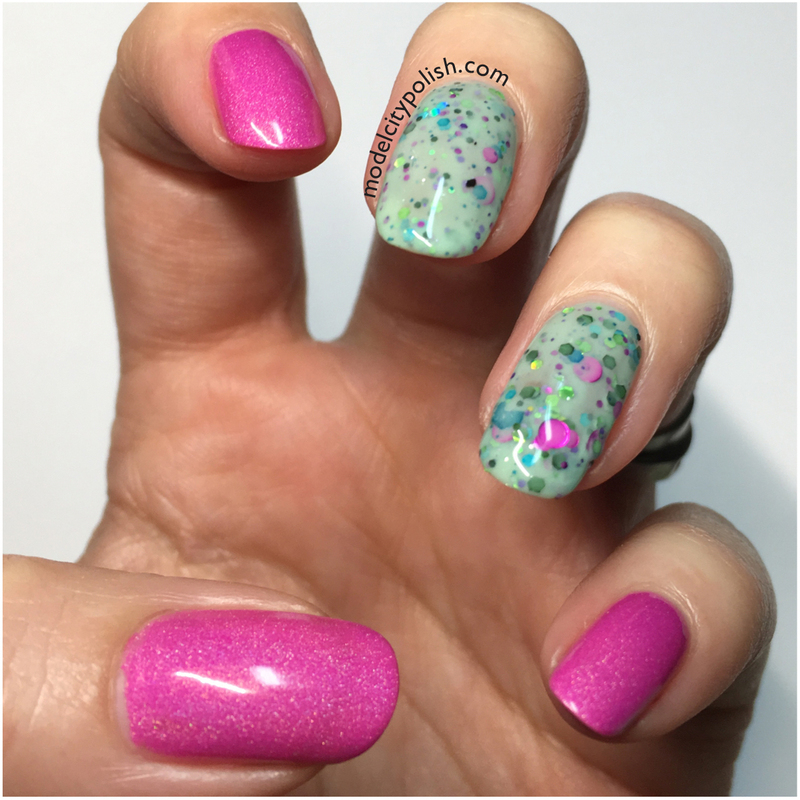 For the first Two for Tuesday look I went with two of the older indies brands, Jindie Nails and Enchanted Polish. You all know my love for Enchanteds and while Jindie isn’t around anymore, I still love their crelly combos. 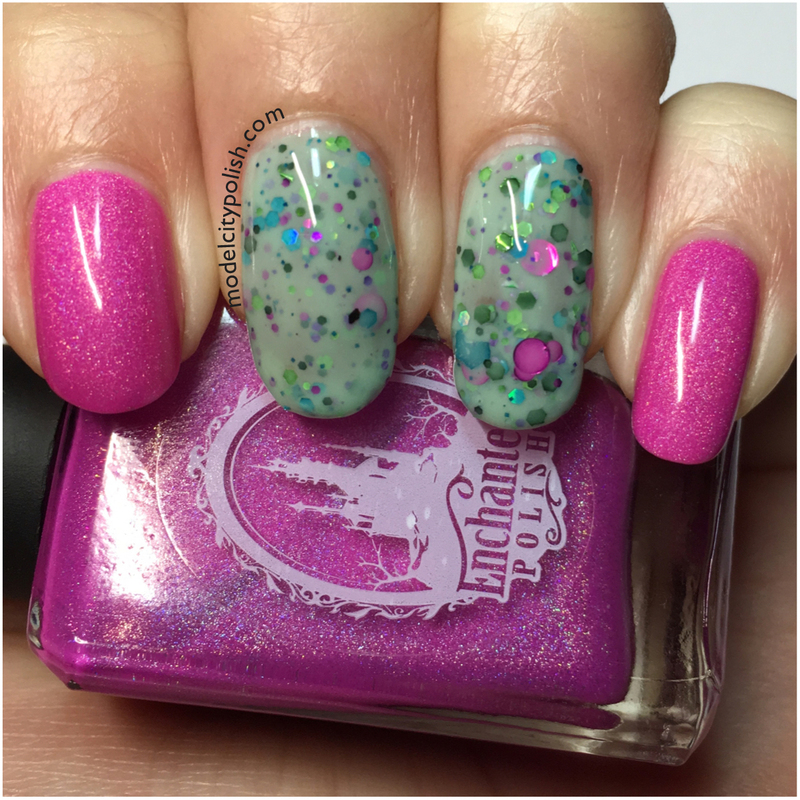 I first picked out Princess Breath from Jindie and wanted to pull out the pink from this gorgeous lacquer. 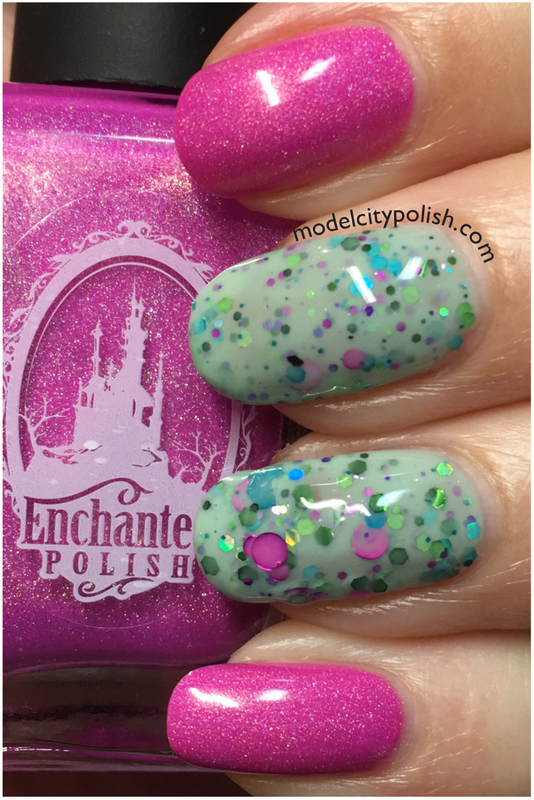 Enchanted Polish’s Dope Jam was the perfect option. I sealed both lacquers with my much loved top coat from SuperChic Lacquer. So what do you guys think of my Two for Tuesday combo/idea? I love it! I finally pulled out that much loved Jindie and the Enchanted reminded me of why I love them so! Thank you so much for stopping by today and I will see you all again soon. These look so good together! Beautiful polishes! Dope Jam is a beaut! I love crellies with large assorted glitter. 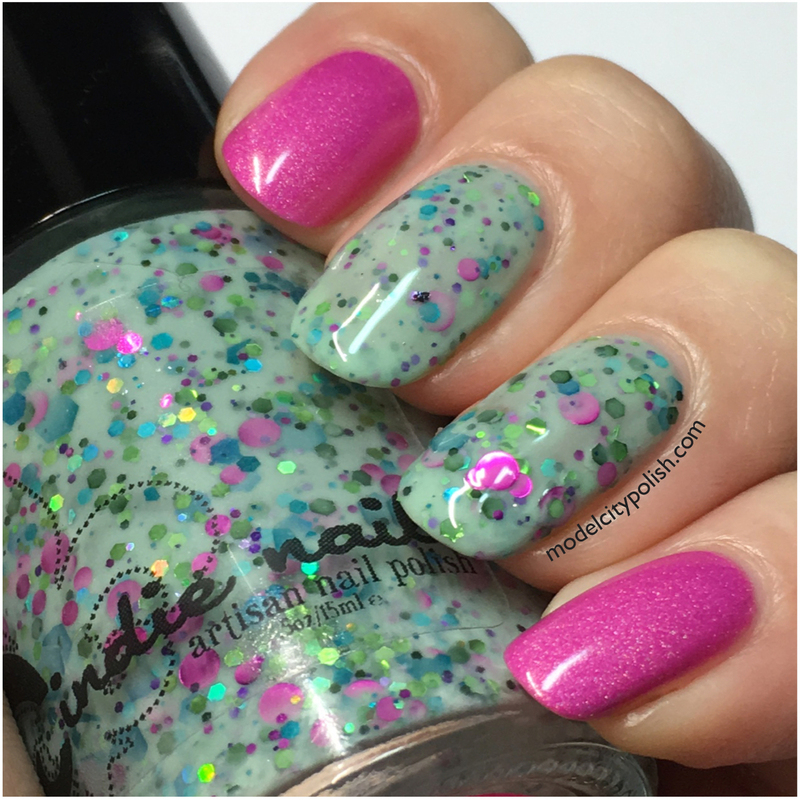 I love manis that compliment crelly glitters! That EP is amazing!!! I love the concept! Make sure you hashtag it so I can watch the process on Instagram! Great idea. 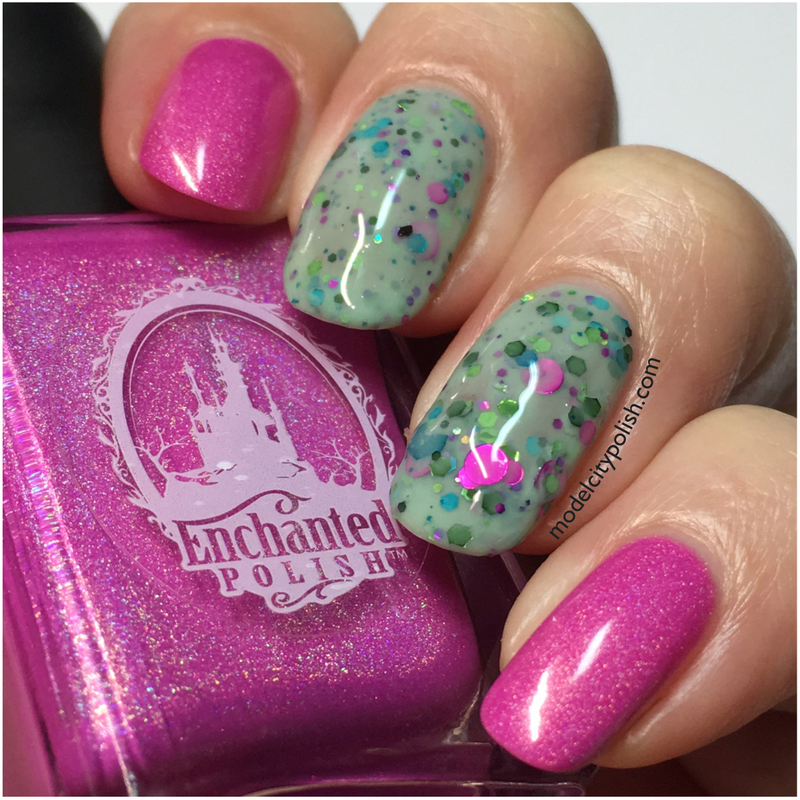 I love the pink Enchanted Polish! AHHHH! That EP sits unused in my Helmer. No more, I tell you. Stunning! Oh man!!!! You are in for a treat! It is AMAZING!!!! Two for Tuesday is a great idea! I have a large collection myself, and I feel guilty for having so many polishes I haven’t even used yet. This looks like a great way to make sure every polish gets a turn. You made some excellent choices this week, great work! Very pretty! 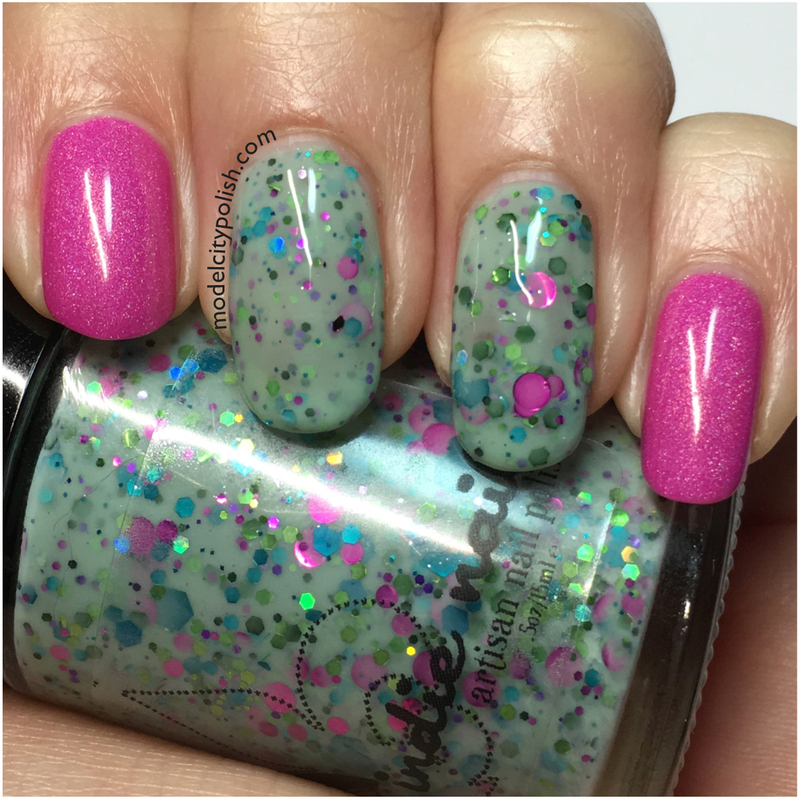 I know lots of indie brands do the crelly + glitter thing, but Jindie Nails did it in a way that stands out!!! Gorgeous swatches and polishes. I live the idea of Two for Tuesdays and your first pairing is perfection! Awesome! I never did try either of these brands. Ooooo!!!! You really need to try out Enchanted!!!! I love dope jam! Did you hear? Jindie is coming back. Dope Jam is pretty amazing! I did just hear she is possibly coming back.